This article is about the economist. For his son, the mathematician, see Karl Menger. Carl Menger (/ˈmɛŋɡər/; German: [ˈmɛŋɐ]; February 23, 1840 – February 26, 1921) was an Austrian economist and the founder of the Austrian School of economics. Menger contributed to the development of the theory of marginalism (marginal utility), which rejected the cost-of-production theories of value, such as were developed by the classical economists such as Adam Smith and David Ricardo. As a departure from such, he would go on to call his resultant perspective, the “Subjective Theory of Value”. Menger was born in the city of Neu-Sandez in Galicia, Austrian Empire, which is now Nowy Sącz in Poland. He was the son of a wealthy family of minor nobility; his father, Anton, was a lawyer. His mother, Caroline, was the daughter of a wealthy Bohemian merchant. He had two brothers, Anton and Max, both prominent as lawyers. His son, Karl Menger, was a mathematician who taught for many years at Illinois Institute of Technology. After attending Gymnasium he studied law at the Universities of Prague and Vienna and later received a doctorate in jurisprudence from the Jagiellonian University in Kraków. In the 1860s Menger left school and enjoyed a stint as a journalist reporting and analyzing market news, first at the Lemberger Zeitung in Lemberg, Austrian Galicia (now Lviv, Ukraine) and later at the Wiener Zeitung in Vienna. During the course of his newspaper work he noticed a discrepancy between what the classical economics he was taught in school said about price determination and what real world market participants believed. 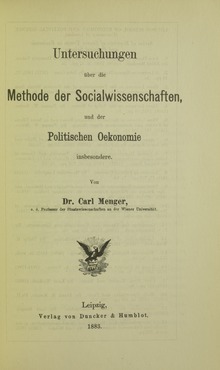 In 1867 Menger began a study of political economy which culminated in 1871 with the publication of his Principles of Economics (Grundsätze der Volkswirtschaftslehre), thus becoming the father of the Austrian School of economic thought. It was in this work that he challenged classical cost-based theories of value with his theory of marginality – that price is determined at the margin. In 1878 Rudolf's father, Emperor Franz Josef, appointed Menger to the chair of political economy at Vienna. The title of Hofrat was conferred on him, and he was appointed to the Austrian Herrenhaus in 1900. Ensconced in his professorship, he set about refining and defending the positions he took and methods he utilized in Principles, the result of which was the 1883 publication of Investigations into the Method of the Social Sciences with Special Reference to Economics (Untersuchungen über die Methode der Socialwissenschaften und der politischen Oekonomie insbesondere). The book caused a firestorm of debate, during which members of the Historical school of economics began to derisively call Menger and his students the "Austrian School" to emphasize their departure from mainstream economic thought in Germany – the term was specifically used in an unfavorable review by Gustav von Schmoller. In 1884 Menger responded with the pamphlet The Errors of Historicism in German Economics and launched the infamous Methodenstreit, or methodological debate, between the Historical School and the Austrian School. During this time Menger began to attract like-minded disciples who would go on to make their own mark on the field of economics, most notably Eugen von Böhm-Bawerk, and Friedrich von Wieser. In the late 1880s Menger was appointed to head a commission to reform the Austrian monetary system. Over the course of the next decade he authored a plethora of articles which would revolutionize monetary theory, including "The Theory of Capital" (1888) and "Money" (1892). Largely due to his pessimism about the state of German scholarship, Menger resigned his professorship in 1903 to concentrate on study. Menger used his subjective theory of value to arrive at what he considered one of the most powerful insights in economics: both sides gain from exchange. Unlike William Jevons, Menger did not believe that goods provide “utils,” or units of utility. Rather, he wrote, goods are valuable because they serve various uses whose importance differs. Menger also came up with an explanation of how money develops that is still accepted by some schools of thought today. ^ Barry Smith, "Aristotle, Menger, Mises:An Essay in the Metaphysics of Economics", History of Political Economy, Annual Supplement to vol. 22 (1990), 263–288. ^ "Carl Menger facts, information, pictures | Encyclopedia.com articles about Carl Menger". www.encyclopedia.com. Retrieved 2017-06-30. ^ "Carl Menger | Austrian economist". Encyclopedia Britannica. Retrieved 2017-06-30. ^ kanopiadmin (2014-08-18). "Biography of Carl Menger: The Founder of the Austrian School (1840-1921)". Mises Institute. Retrieved 2017-06-30. ^ "On the Origin of Money" (English translation by Caroline A. Foley), Economic Journal, Volume 2 (1892), pp. 239–55. ^ Carl Menger (1840–1921). The Concise Encyclopedia of Economics. Library of Economics and Liberty (2nd ed.). Liberty Fund. 2008. White, Lawrence H. (2008). "Menger, Carl (1840–1921)". In Hamowy, Ronald (ed.). The Encyclopedia of Libertarianism. Thousand Oaks, CA: SAGE; Cato Institute. pp. 325–26. doi:10.4135/9781412965811.n130. ISBN 978-1-4129-6580-4. LCCN 2008009151. OCLC 750831024. Principles of Economics, online version provided by the Ludwig von Mises Institute. This page is based on the Wikipedia article Carl Menger; it is used under the Creative Commons Attribution-ShareAlike 3.0 Unported License (CC-BY-SA). You may redistribute it, verbatim or modified, providing that you comply with the terms of the CC-BY-SA.